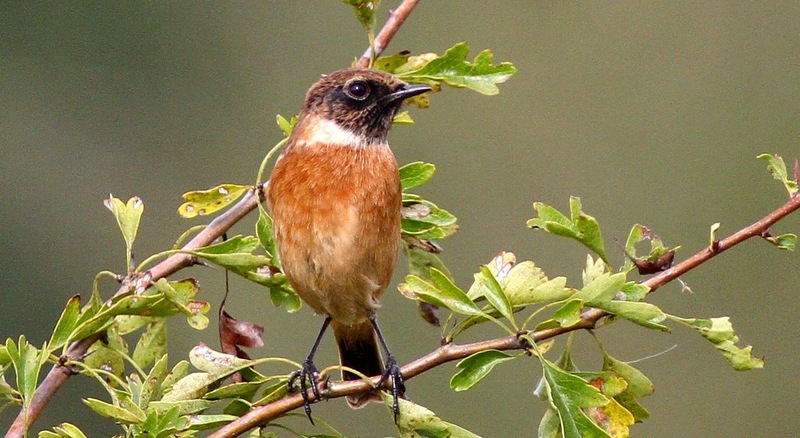 A MALE STONECHAT AT MARSH LANE. Didn't fancy going out at all today as I was feeling out of sorts but the threat of paying out some fines on some overdue library books had me driving to Knowle just before lunchtime.As I had made the effort to go I thought I'd nip across to Marsh Lane for an hour. My good friend Jeff Rankin was in the CP hide and he pointed out the female Pintail but together we could not find the Garganey reported earlier.The Pintail would not play ball and stayed a long way off. 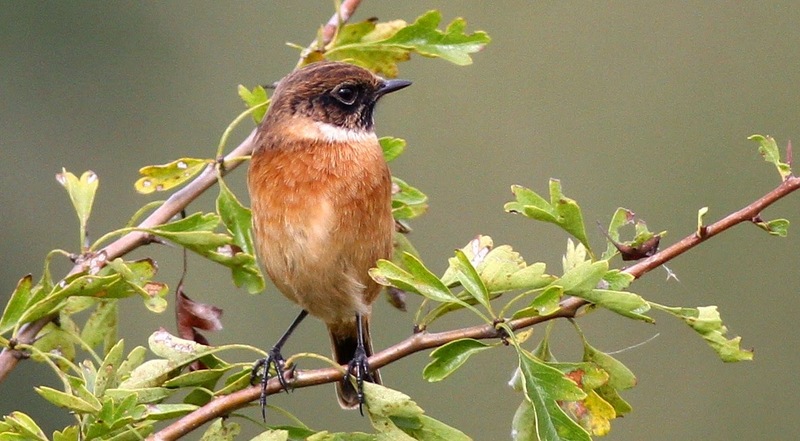 After a while I decided to have a quick look in the Oak hide where after scanning around and seeing nothing interesting I spotted a male Stonechat in the distance in the reedbed to the right of the Oak hide. Gave Jeff who was still in the CP hide a call and together we had some occasional very good views as it kept flying from perch to perch.I don't see these chaps too often these days in fact the last one I had good views of was at Marsh Lane in the Spring.Cracking bird. I was about a week late but this morning I finally decided to go over to Shustoke Reservoir and see if the Ruff(s) and the female Garganey were still about and would like to be photographed. Got there at 10.30 AM and had a bit of luck because I bumped into Dennis who quickly pointed out the female Garganey to me.A bit distant but great to see it was still there. Dennis and I strolled down towards the west end of the reservoir and I soon spotted a Ringed Plover feeding on the edges. As others have said the Ruff(s) have showed well and today was no different there was only one but it was very obliging not at all fussed by an ageing photographer getting pretty close.I've never got this close to a Ruff before even in Norfolk. At one time it had been in front of me for over 10 minutes so I asked it what it thought of my photography skills.This is the reply I got. Later that afternoon from my back garden a couple of Ravens cruised over pretty high up. A VISIT TO UPTON WARREN. Having stayed in on Friday so when the weather man told me it would brighten up Saturday morning I headed off to Upton Warren hoping the Temminck's Stint was still on the Flashes. It would not be a life tick as I'd seen four from the North hide at Cley in 2008 but they had been a long way off in very poor light and my shots had been dire so I went to the Flashes hoping to get some better ones. Got to the hide at 8.30 AM and joined a few birders.As usual there was good and bad news.The good was that the Stint was still there.The bad was it was a long way off and it was very gloomy. I stayed in the hide for nearly 5 hours and although the Stint flew around a few times it always landed on a distant shore.The weather man had let me down as well and the whole time I was there it was very gloomy and it rained on and off all morning. The shots I took were far worse than the ones I got in Cley and I never show those to anyone as they are dire.Oh Dear ! ! I hope you can pick the Stint out in these shots. It wasn't all doom and gloom.A Wheatear showed for a while.There was a Green Sandpiper feeding in the gloom.A Sparrowhawk flew past the hide and landed on a distant post.A pair of Grey Wagtails dropped in for a brief visit. Just before midday this chap and two of his mates wandered across the scrape and came over to inspect the hide. A VISIT TO MARSH LANE. As the forecast for Tuesday was very good I decided to have a day at Marsh Lane and got there at 10.30 AM. Soon joined up with some friends and together we had a good look round.It was very enjoyable in the very pleasant weather but other than a Little Egret and a Green Sandpiper we found nothing new. After a nice picnic lunch in the car park I found that at 12.30 PM I had the place to myself so I headed down to the Oak hide to see what I could point the camera at.Quite soon I spotted a Fox on the far bank. It was good to see that duck numbers were going up with Teal,Wigeon and Shovellers amongst those on show.The Little Egret dropped in again and a Green Sandpiper showed briefly.A Greater Spotted Woodpecker was on the feeders and a juvenile (?) Kestrel flew past the hide. At 2.00 PM the Hobby showed up and started hawking for dragonflies.I cannot complain this time I couldn't get close because on a couple occasions it did fly over me.Pity that it was between me and the sun.Great fun though trying to get a killer shot. As it's still the Hobby season I've paid several visits down to Marsh Lane trying to get some shots of these great birds. As usual there is good and bad news.The good news is that I've seen a Hobby usually round the railway pool every time I've been down there.The bad news is I've struggled badly to get a decent shot mainly because the Hobby has been very difficult to get close to. These are my best of the loads I took last week which are nowhere near as good as the ones I got last year mind you it's great fun trying. Yesterday afternoon the first Common Gull I've seen there for ages showed up on the railway pool but soon flew off. CHASING HOBBIES AT MARSH LANE. After the excitement of visiting Norfolk last week I thought I'd better do some local birding so on Monday and Tuesday I popped over to Marsh Lane with my main aim to get some Hobby shots before they head off. On both days a Hobby turned up and showed well but I struggled to get any decent shots.The bright sunshine was a bit of a problem and as usual they zoomed around a lot making it very hard to lock onto them.These are my best shots of a pretty poor bunch. This shot could have been a cracker but I missed out.The Gull is blown out and the Hobby is too dark and the focus is not good. Other birds flying around incl. a Sparrowhawk and a Jay.Not got many Jay flight shots. From the Railway hide on Tuesday a late Common Whitethroat showed well briefly. Also from the Railway hide on Tuesday a female Stonechat showed for a while but it was a long way off and would not come close.